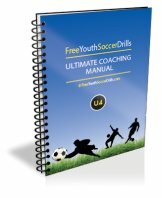 Soccer skills that will help you get past defenders! Performing soccer skills aren’t a necessity for playing the beautiful game. You rarely see defenders trying skills with the ball because they are coached to play solidly and not give the ball away. Performing a skill in the wrong area can lead to an opposition player gaining possession of the ball and creating a goal scoring opportunity. These skills are predominantly used by attacking players such as wingers, wide players and forwards. Skills can help players get past opposing defenders by changing direction quickly and having quick, fancy footwork. The below skills all have a difficulty rating from easy to hard to help you work out which ones to teach the age group you are coaching too. If you are after soccer turns or tricks please go to the soccer moves page using the below link or following the ‘skills & tricks’ tab on the main screen – left hand side. This skill is an easy one to learn but once performed with speed and intensity can be a great way of avoiding an opponent. The concept is simple and involves using the bottom of your foot to roll the ball toward your opposite leg. If you’re right footed, you will roll the ball from right to left but in a slightly forward diagonal movement. For beginners, start with your right foot on top of the ball and roll the ball across your body in one movement. Don’t keep your foot on top of the ball or you will lose balance. You are effectively rolling the ball quickly from one side to the other. For more advanced players, run toward the ball and plant your weaker foot diagonally behind the ball and with your other foot quickly roll the ball diagonally forward. So for a right footed player, left foot will be planted, the ball will be slightly forward to the right, and you will roll the ball diagonally left-forward. This is good when you are going to reach the ball a split second before a defender and want to get past them. This is the simplified version of the ‘scissor’ soccer skill which you will learn later. This is one of the easiest skills to learn but is also the most widely used by amateurs and professionals alike. You make the opponent believe you are going one direction and then push off and go in the other direction. For beginners, it is best to practice this skill with a static ball. Stand with the ball slightly in front of your feet. With your left foot, step to the side of the ball and leave a gap between your foot and ball. With the balance on your left foot, move your right foot between your left foot and the ball and push the ball with the outside of your right foot in a diagonally forward motion to the right. For advanced players this skill must be performed at pace whilst dribbling with the ball. Firstly, read the beginners version above to get a grasp of how this skill works. You will need to dribble with the ball first as if your running at an opponent. Then when you are about a meter away from your opponent jump on to your left foot, with your body low and make it seem you’re going to the left. Then push off to the right using the outside of your right foot to take the ball with you and past the player. This is a natural progression from the above ‘inside roll’ skill but this time you will allow yourself to dribble away at pace. You will perform the above advanced version of the inside roll approaching the ball at pace. Once you have rolled the ball from one side to the other you will plant the foot you have just used and with your other foot and push the ball forward with your other foot. The ball should now be rolling forward away from the defender to your side and you can follow your ball. This is just a slightly more fancy skill and adaptation of the inside roll listed above. It involves the ball once again being dragged across your body but this time you will allow the ball to roll under your left leg as you step over it. It is to deceive the defender into thinking you’re going to take a touch forward when actually the ball will continue to run to the side. This skill is once again all about changing directly quickly, making it look as if you intend to go in one direction and quickly changing at the last second. You will be using the same foot for this skill and using the inside and outside of your foot. Firstly, dribble toward the defender using inside touches of the foot (right footed players will be going diagonally left toward defender) and at the last second use the outside of the same foot to push in the other direction (diagonally right for right footed player). This skill is a personal favourite of mine, the complete art of deception when performed correctly. It is the natural progression from the ‘step and push’ skill mentioned above. The ‘scissors’ involves the use of both feet; for the sake of explanation I will describe the skill with reference to a right footed player. You begin by dribbling the soccer ball toward the defender. You will pretend to go to the left by wrapping your left leg around the back of the ball (without touching it). Your left leg will step to the left of the ball, the defender by this time will have moved their body weight toward your left allowing you to perform the second part to this skill. Use the outside of the right foot to push the ball diagonally right past the defender whose momentum should be going the other way. This is basically a double bluff progression on the ‘scissors’ skill explained above. After wrapping your left leg around the ball instead of pushing off with the ball in the other direction (right), you will use this leg to wrap around the ball once more. Therefore, you have fooled the defender in thinking you’re going left, then that you’re going right but you end up pushing off to the left once more using the outside of the left foot. Instead of soccer skills, why not try these turns and flicks?